Milestone Environmental Services (Milestone), an industry leader in oil and gas waste management, has opened its state-of-the-art facility to serve E&P customers in the northern Delaware Basin. The location in northern Reeves County is five miles east of Orla on FM 652 in the heart of the northern Delaware Basin drilling activity in Texas and southern New Mexico. At this new site, Milestone will primarily accept drilling waste streams, including water-based mud and oil-based mud, along with some completion and production waste such as tank bottoms and water waste streams. The facility started receiving shipments from customers in July and is operating 24/7. Milestone will host a grand opening event at the facility on August 7-9. Milestone is committed to being a good neighbor, environmental steward and corporate citizen. The Orla facility is designed to minimize the impact on the environment and the community. The facility will minimize waste by reusing salt water, recovering oil and capturing solids. 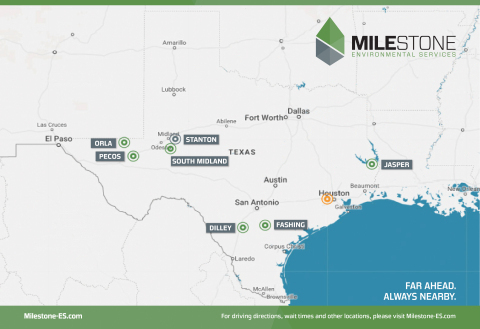 By locating facilities near drilling activity, Milestone reduces truck trip times and traffic along the highways which benefits the community and saves customers time and money. The facility is situated on acreage to decrease noise, lights and dust for neighbors. At Milestone, employees have access to competitive wages, affordable comprehensive benefits, onsite housing, and the chance to build a career. The company hired 15 additional employees to run and support the facility, plus local sales personnel to support customers. In keeping with the company’s philosophy of promoting from within, Milestone also advanced several employees from within the company because of the growth expected. Milestone Environmental Services is an oilfield environmental services provider with an environmentally-focused, cost-effective, and efficient approach to managing oilfield waste. Milestone operates strategically-located, state-of-the-art disposal facilities that provide dependable, local services for leading U.S. oil and gas operators. Milestone is a premium provider of oilfield waste disposal, operating for 25 years. The company is headquartered in Houston, Texas, and currently operates six oilfield waste management locations in the Permian Basin, Eagle Ford Shale and Haynesville Shale. Another new facility is under construction near Stanton, TX and is expected to open in August, making it the fourth in the Permian Basin and the seventh location in Texas. For more information, please visit www.milestone-es.com.